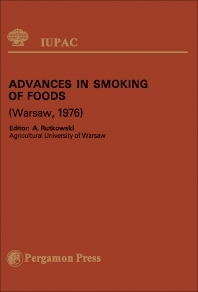 Advances in Smoking of Foods covers the plenary lectures presented at the International Symposium on Advances in Smoking of Foods, held in Warsaw, Poland, on September 8-10, 1976. The book focuses on the processes involved in the smoke curing of foods, as well as on the analysis of the production of smoke and compounds found in it. The compilation first offers information on the phenomena of quality in the smoke curing process, including the history, reviews, and advances of the process. The book then evaluates the physical and chemical processes involved in the production and application of smoke. The processes considered in the production of smoke from wooden materials are underscored. The text presents an analysis of smoke and smoked food, wherein it is posed that wood smoke is composed of compounds formed by the pyrolysis of wood constituents such as cellulose, hemicellulose, and lignin. Polycyclic hydrocarbons and phenolic compounds are discussed. The book also explains the contributions of smoke compounds to sensory, bacteriostatic, and antioxidative effects in smoked foods; facts and legislation regarding polycyclic aromatic hydrocarbons in smoked foods; and concepts in technology and design of machinery for production and application of smoke in the food industry. The selection is a vital source of information for readers wanting to study the smoke curing of foods.